On our week-long Churchill trip in mid-November, it was only clear enough to view the aurora borealis on one night, and then they were only visible for maybe thirty minutes. We tried to make the most of it. In this image we are facing north. 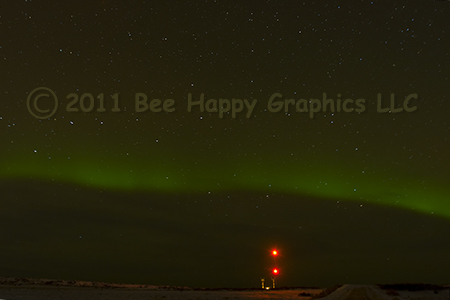 The aurora is a straight green ribbon stretching across the sky. Just above the aurora on the left side of the picture is the big dipper. In Miami it would have been below the horizon at this time. The shutter is all the way open for a minute with high ISO. Photographic details: Canon EOS 20D camera w/ EF 16-35 f/2.8 L USM lens set at 16mm. Camera was on f/2.8 for 60 seconds at ISO 1600. Fine Art Paper 11" x 17" 13" x 20"
Canvas N/A 18" x 28"